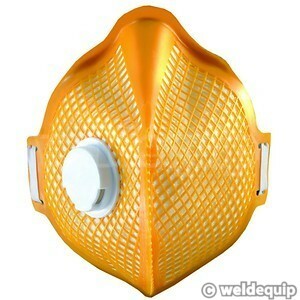 For welding fumes, grinding, polishing, finishing etc. The ESAB Filtair series of disposable respirator masks use the very latest filter technology to give lower breathing resistance, whilst still maintaining a high level of fume protection & comfortable fit. An outer mesh shell supports the filter media preventing collapse on to the face, and a preformed nose bridge provides a comfortable fit without the need for constant adjustment. Fitted valve to reduce heat & moisture build up within the mask & fully adjustable straps with buckle fastening. The Filtair A-3V offers the highest level of protection from a disposable respirator mask and is suitable for use when welding, grinding, polishing, finishing, machining etc.